Abstract: Objective To study the effect of epigallocatechin gallate (EGCG) on colorectal adenoma induced by azoxymethane (AOM)/dextran sulfate sodium (DSS) in mice. Methods Thirty young, female mice were randomly divided into control, AOM/DSS, and AOM/DSS+EGCG groups (n=10 in each group). The body weight, mental status, and defecation of mice in each group was recorded every week, for 13 weeks, at the end of which the mice were sacrificed. The incidence of colorectal adenoma and the number of tumors in each group was recorded. Immunohistochemistry was used to detect the expressions of CD31 and CD68 in colorectal tumor tissues. 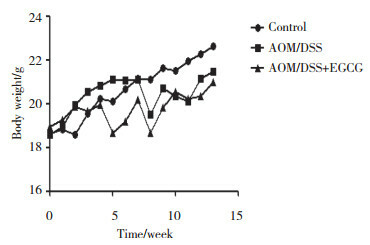 Results No colorectal adenoma was found in mice of the control group. 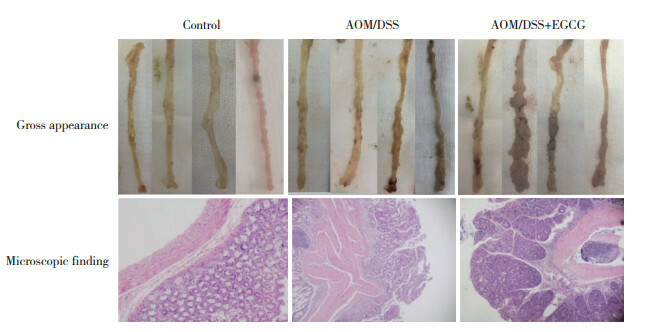 Colorectal adenoma was found in 4 mice of both AOM/DSS and AOM/DSS+EGCG groups. the incidence of colorectal adenoma was 50.00% (5/10) in the AOM/DSS group and 66.67% (6/9) in the AOM/DSS+EGCG group (P > 0.05). The number of tumors in the AOM/DSS+EGCG group was higher than that in the AOM/DSS group (8.25±2.06 vs 3.75±1.71, P < 0.05). 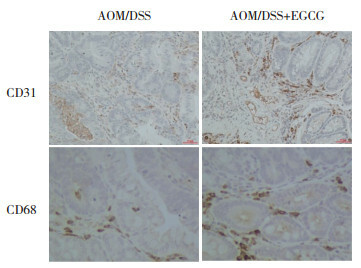 The expression levels of CD31 and CD68 in the AOM/DSS+EGCG group were higher than those in the AOM/DSS group (P < 0.05). Conclusion EGCG might promote the occurrence of colon dysplasia and colon adenoma. 1)P < 0.05 vs control group; 2)P < 0.01 vs control group. 1) P < 0.05 vs AOM/DSS group. WEIDNER N. Current pathologic methods for measuring intratumoral microvessel density within breast carcinoma and other solid tumors[J]. Breast Cancer Res Treat, 1995, 36(2): 169-180. SENO H, OSHIMA M, ISHIKAWA TO, et al. Cyclooxygenase 2-and prostaglandin E (2) receptor EP (2) -dependent angiogenesis in Apc (Delta716) mouse intestinal polyps[J]. Cancer Res, 2002, 62(2): 506-511. DELIU IC, NEAGOE CD, BEZNĂ M, et al. Correlations between endothelial cell markers CD31, CD34 and CD105 in colorectal carcinoma[J]. Rom J Morphol Embryol, 2016, 57(3): 1025-1030.